Last year at about this time, I shared my grandmother’s decades-old recipe for peanut butter eggs. So it seemed only fair to offer the recipe that my family deems its counterpart. To be sure, both versions have a loyal following. Non-coconut lovers have actually converted after sampling this treat. I have told my parents–who seldom argue but have bickered over these–that I will take their box away if they don’t agree to share. Delight as they do, some years I stash two small boxes in the freezer to dole out on their birthdays. A very exciting moment occurred several years ago when a friend, whose husband worked for a chocolate company, arranged for a small group of friends to make these treats at her husband’s facility. The adventure was sure to be fun and, no doubt, easier than crafting hundreds of these by hand in my own kitchen. I had visions of the candy “insides” rolling down a conveyor belt, leading them to a vat of melted chocolate. They would plunge into the sweet brown liquid and quickly emerge, perfectly encased in dark or milk chocolate. As it turned out, we were given a lesson on hand-tempering chocolate and proceeded to dip every last candy egg by hand. The process wasn’t any quicker–and we were literally up to our wrists in chocolate. But what could be bad about that? It was a real-life Charlie and the Chocolate Factory experience for sure. The beauty of these treats, however, is that they taste just as good out of a home kitchen as they do from a commercial kitchen. Ultimately, they will taste far better than most store-bought candy because there are no extra preservatives, additives, artificial colors, etc. Buy the best chocolate you can. For coconut eggs, I really love dark chocolate, but choose the variety you love the most. I pat the dough into blocks and then refrigerate until firm. You may do this up to a few days in advance of rolling and dipping. 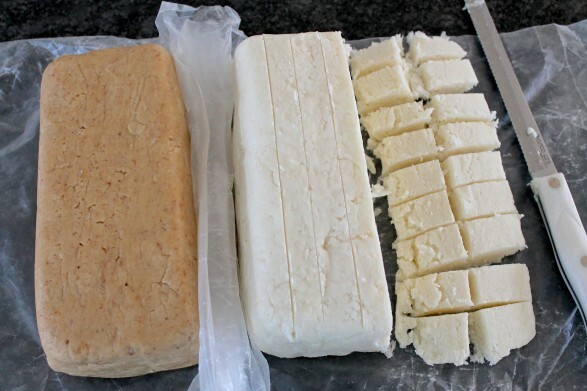 Slicing the chilled blocks into squares, as shown above, makes it very easy to make uniformly shaped eggs. The insides, ready to be dipped. For the peanut butter egg recipe, see the link below. Click here for the Peanut Butter Egg recipe. OMG OMG OMG. I have to make these! I have to. I’m barely awake @ 6:51am and I want to make these now. You rock! Oh and I’ve given you the Versatile Blogger Award. Come check it out on my blog! You just made my day…thank you! They are my favorites: ) And I will go check out your blog right now! Should the coconut be sweetened or unsweetened? I have always used the sweetened version but I think it would work with the unsweetened. The sweetened bag typically notes “flaky” and the texture is slightly different. I can attest that the sweetened coconut makes a great finished product! Coconut is my absolute favorite, anyway I can get it…candy, cake, pie, right out of the bag (or the shell! )….in everything! I can’t wait to try these…especially with the cream cheese (another thing I love!). I have been a coconut cream fanatic forever, this recipe will top off our Easter Feast, the Easter Bunny will show up with the goods! These are a major family favorite in our house as well. Have a happy Easter! Can someone tell me another name for Confectionery sugar! Thanks. Confectioner’s sugar is also called !0X or powdered sugar, Felicity. I hope that helps! How do you convert it so as not to have to use coconut??? If you simply omit the coconut, the recipe would be a basic buttercream egg. I never make them this way because we have a lot of coconut lovers here, but you could. The peanut butter eggs are a great option, too! Thank you for the thoughtful comment, Beverley! I used to make these with my grandmother so the memories are as sweet as the chocolate! I made coconut eggs today too. I think I may have to try them this way next year. How fun to get to go to a chocolate company and make your candies! There’s a place not too far from my house that makes the best truffles. It really was fun, Janette, and I hope you like this way of making them! What is the shelf life of these and and do they need to be refrigerated? What about the peanut butter eggs? They sound absolutely delicious! How many do you get from this recipe? Is it approximately 100 like the peanut butter eggs? Coincidently, I just counted my batch because I realized I didn’t include a yield. This year, I must have made them a little bigger as I got 90. Usually, I end up with a few more coconut eggs than peanut butter eggs. But basically, it is pretty close. Thank you!! Definitely going to try these!!! You are welcome, Marianna! I hope you love them as much as we do! If you make larger eggs, the yield will be less…but they will still taste great! I don’t, Rhonda, but they sure sound good! Without the coconut, the recipe is essentially a buttercream egg. You could certainly add pecan bits, although I would start by adding a lesser amount as the pecans would be denser than the coconut. I think I would add and taste until I achieved the consistency and flavor I liked. Let me know if you try! May I mix bakers semi-sweet chocolate with candy wafers melted down for the butter cream Easter eggs? This should work well, Loretta. As an added precaution, just follow the tips under the tempering paragraph, adding in some of the Baker’s chocolate after the first portion has melted. This should ensure it sets up perfectly. I’ve always used sweetened because I like the texture better in this recipe. If you prefer unsweetened, however, you could use that instead. I cant wait to try this recipe. Hope you love them as much as we do, April! These look wonderful, Ann! I think I know just what everyone will be getting in their Easter baskets this year… 😉 Love that it’s such an old recipe, too! Thank you, Dianna! I’m so happy you’re going to make these and am optimistic they will be a hit! When freezing chocolate cream eggs, should they be individualy wrapped before freezing so they don’t get stuck to each other? Hi Cathy, I’ve never wrapped them separately and have never had a problem–although when layering them in a large container I do separate the layers with a piece of waxed or parchment paper. Hope that helps! If you do, I hope you enjoy them as much as we do! Hi! 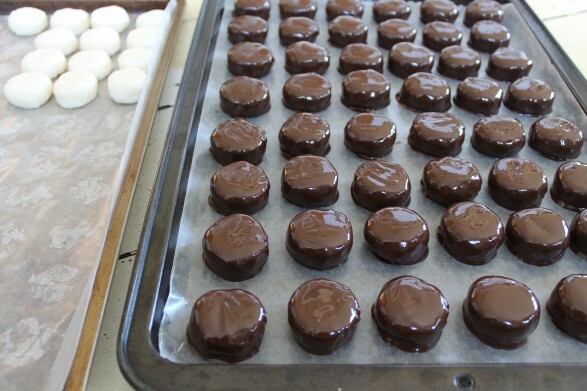 Fellow Lancastrian here 🙂 I made peppermint patties in the past and rolled the peppermint filling like a fondant then cut the shape with a cookie cutter- I am wondering if you think the coconut or PB filling would be possible to do this way? I made your PB eggs last year (amazing, reminded me of my grandmas! )but I forget the consistency. Just was thinking of trying something different this year with the cutters to save some time. Thank you! First of all, I’m glad that we’re “neighbors” and so happy you love the peanut butter eggs! I think your concept would work with both the peanut butter and coconut eggs. If the filling gets too soft to work with, you can put it in the fridge briefly to firm up. If you try, I’d love to know how you make out! Hi again! I am super happy with this new method I tried! Yesterday I made both fillings. I lined rimmed baking sheets with parchment (I grab the 1/2 pan flats already cut at Clarks restaurant store! 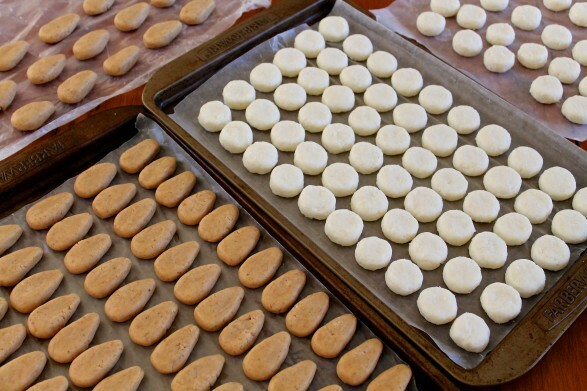 ), presses down the filling, put another piece of parchment on top and rolled to even thickness. They stayed in the fridge until tonight when they cut out beautifully! I used oval cutters but will find egg shapes in appropriate size next year 🙂 tomorrow I will dip! I also make the PB at Christmas so I plan to try Star and tree cutters I think the cream cheese keeps this filling a dense enough consistency that the rolling/cutting works. Happy Easter! Hi Megan, I love your technique and the idea to use fun shapes for various holidays. The cream cheese is the secret ingredient in terms of the texture and flavor of these eggs, and I’m so glad it makes for good cutting, too. Thanks so much for your wonderful feedback! These and the peanut butter eggs are both excellent. I make the filling at other times of the year and make “truffles”. I’m thrilled these have become a year round favorite, Eileen! I’m not sure what exactly you’re asking, Jan. If you can clarify, I’d be happy to help! I tried these for Easter and they turned out great! They taste so good! I used semi sweet chocolate but next year will make half with bittersweet. Also next year I will add two whole almonds to the top of half. I used your method of making the rectangle and refrigerating and the cutting! This method made it easier to shape the eggs evenly. I was able to shape the eggs and put them in a bowl and back to frig before dipping. Thank you for sharing! What a wonderful comment, Shirley! I’m delighted you were pleased with the recipe and love your ideas for next year’s batch. I’m a big fan of dark chocolate with this filling! I’ve never thought to use mashed potatoes in this recipe, that’s for sure! That’s some very creative ingredient tweaking, Carol. Thanks so much for your comment. I haven’t, Carol, but coating wafers do work well. As long as you like the taste of the chocolate you should be fine with them.